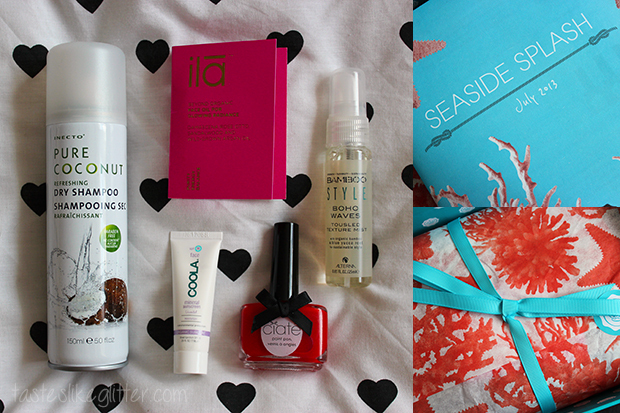 Summer is finally upon us and with that Glossybox bring us the 'seaside splash' box*. Dry shampoo is a total life saver for me. Not only does it give my hair volume without weighing it down, it helps me preserve the bright colour for far longer. I love anything with a coconut scent and this smells delicious. It's sweet, light and summery. It works just in the way Batiste does. Spray it on, work through with fingers and then brush out. Done. This little vial of face oil is a blend of Argan and rosehip seed oil which are high in anti-oxidants, helping to combat premature ageing. It's said to give a healthy glow, improved texture and radiance. I'm not big on the scent but it spreads evenly over the skin and sinks in easily without leaving any residue behind. This is no use for my length of hair currently so I'll be passing it along to someone else. Whilst SPF should be used all year round, we're definitely at a point where we need to take that extra precaution if you don't already. This SPF cream has a light, thin texture making it easily blendable and not at all greasy. Perfect for using underneath makeup as I find some SPF creams can still leave my face looking very shiny. Mistress is described as a true red with just a hint of coral. It's a jelly finish and probably one of the brightest reds I own. lovely. Usually I don't get all that envious of the other variations of the month. But when I saw people getting 6 products, which included 2 full size Sleek Pout Paints that were classed as 1 product, that was slightly annoying. Hopefully next month will be somewhat slightly fairer. I wasn't a massive fan of this box but the dry shampoo and polish are things I will be using up.